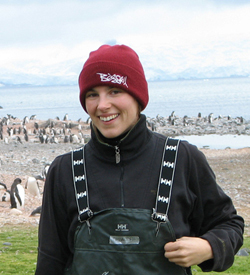 The delicate ecological balance and extraordinarily productive waters of Antarctica's Ross Sea are under scrutiny this season by a team of scientists including SciCom graduate Cassandra Brooks, who is reporting on the research cruise for National Geographic. Brooks, a multimedia journalist and a 2009 graduate of UCSC's science writing program, is part of a two-month expedition studying the sea's intense annual blooms of marine algae, the most productive such explosion of life in the Southern Ocean. The plankton are at the base of a remarkably rich food web of fish, seals, whales, penguins, and seabirds in the Ross Sea, considered one of the planet's last intact ecosystems. Brooks is filing stories about the team's work on the National Science Foundation icebreaker Nathaniel B. Palmer for National Geographic's Ocean Views, a blog focusing on conservation issues facing the world's oceans. The cruise, called TRACERS: TRacing the fate of Algal Carbon Export in the Ross Sea, embarked from Antarctica's McMurdo Station on February 12 and will return to land at Punta Arenas, Chile, on April 5. "We will be the first to trace the path of this massive flux of carbon through the water column as summer turns to fall and the waves, wind, and snow unleash their autumn fury," Brooks writes in her first post. At the end of the mission, scientists also will spend a week studying a colony of emperor penguins at Cape Colbeck, Antarctica. 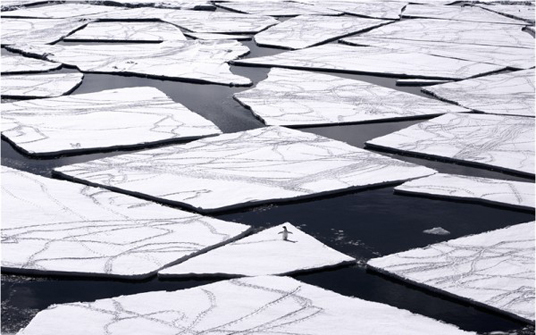 Brooks has worked in the Ross Sea for years. She studied its population of Antarctic toothfish (one of two species known as "Chilean sea bass") for her master's degree research at California's Moss Landing Marine Laboratories before enrolling in the Science Communication Program. After completing the program and working at a series of national print and multimedia internships, including a reporting stint at the Seattle Times, Brooks assumed responsibility for the news website of an international project dedicated to preserving the Ross Sea, called The Last Ocean. Brooks now is pursuing training in international ocean policy as a Ph.D. student at Stanford University's highly selective Emmett Interdisciplinary Program in Environment and Resources. She plans to work at the intersection of policy and public outreach on issues of marine resources, especially fisheries management and the traditions of marine-based indigenous cultures. "I hope to apply these political, scientific and cultural frameworks to the high seas and other ocean regions in urgent need of sustainable management," Brooks says.